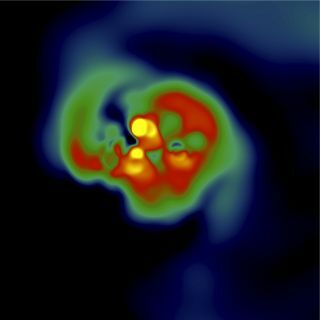 This image depicts a simulation of the formation of the first stars showing fast rotation. The first stars in the universe may have been extraordinarily fast spinners, whirling at more than a million miles per hour, scientists say. These stars, which researchers called "spinstars," formed right after the Big Bang 13.7 billion years ago and were likely massive giants, with eight times or more the mass of our sun, according to a new study. They lived fast and died young, after no more than 30 million years. The nuclear fusion reactions that drove these stars also provided the universe with its first elements heavier than helium. A 12-billion-year-old globular cluster of stars known as NGC 6522 provided the basis for the proposal of spinstars. Astrophysicist Cristina Chiappini at the Leibniz Institute for Astrophysics in Potsdam, Germany, and her colleagues re-examined data they had gathered on NGC 6522 using the European Southern Observatory's Very Large Telescope (VLT). They discovered eight old stars with strangely high levels of the rare elements strontium and yttrium. This high rate of spin would cause overlap between inner and outer gas layers of the star that would not otherwise mix. The resulting cascade of nuclear reactions would generate radioactive neon, which in turn would emit neutrons that would collide with iron and other heavy atoms to create strontium and yttrium. After the spinstars died, these elements made their way into new star-forming clouds and eventually into the stars of NGC 6522, researchers added. These findings suggest that spinstars may have changed the face of the universe in dramatic ways. For instance, their fast spinning could have led them to create and disperse heavy elements across the universe much earlier than thought. Their whirling could also have led to a greater-than-expected number of gamma ray bursts, the most powerful explosions known in the universe. Their rapid rotation could have made spinstars shine brighter than slower stars. This could potentially help explain the mysterious "reionization" of the early universe, when the hydrogen that once pervaded the universe was ionized into its constituent protons and electrons some 400 million to 900 million years after the Big Bang. The researchers said the spinstars also could have lost mass during their evolution via stellar winds, which could help explain why the imprints of very massive stars believed to have existed in the early universe are not seen. The researchers are continuing to look for more evidence of these spinstars. "We have already applied for VLT time to get more data for the NGC 6522 stars," Chiappini said. The scientists detailed their findings in the April 28 issue of the journal Nature. Follow SPACE.com contributor Charles Q. Choi on Twitter @cqchoi.Visit SPACE.com for the latest in space science and exploration news on Twitter @Spacedotcom and on Facebook.